If you look up “Acrobatic pizza” on Google, you will find pages about Pasqualino Barbasso a pizza chef who got his shot to fame after winning Sicily’s acrobatic pizza championship back to back in the years 2001 and 2002. 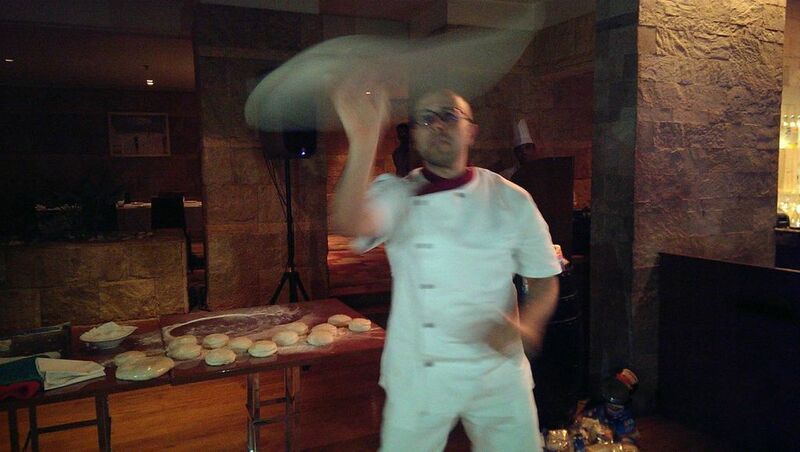 He stills runs his family pizza restaurant in Italy but most of time is around trotting the globe to mesmerize audiences with his tossing skills. The J W Marriott, Mumbai is hosting Barbasso until 17th May and he will attempt to take pizza experiences in the city to a new high. I was privileged to watch him perform at a Chef’s table hosted by the hotel in association with FBAI. The table was set with antipasti, a vegetarian and a non-vegetarian selection. 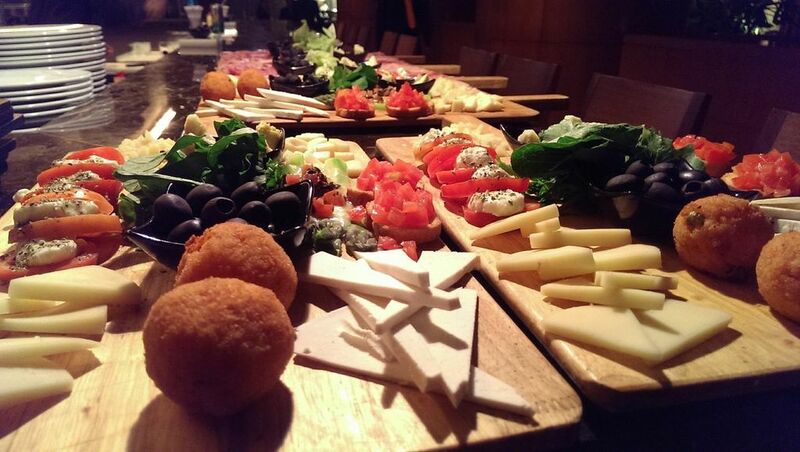 The vegetarian included a variety of cheese Provolone, Parmesan, Salted Ricotta apart from Bruschetta, Arancini and Asparagus with Taleggio, they were very well presented and a thoughtful choice. The selection of breads however was mediocre, the Ciabatta was rock hard, the tomato flat bread (foccacina) was burnt but the herbed version was nice and crisp. 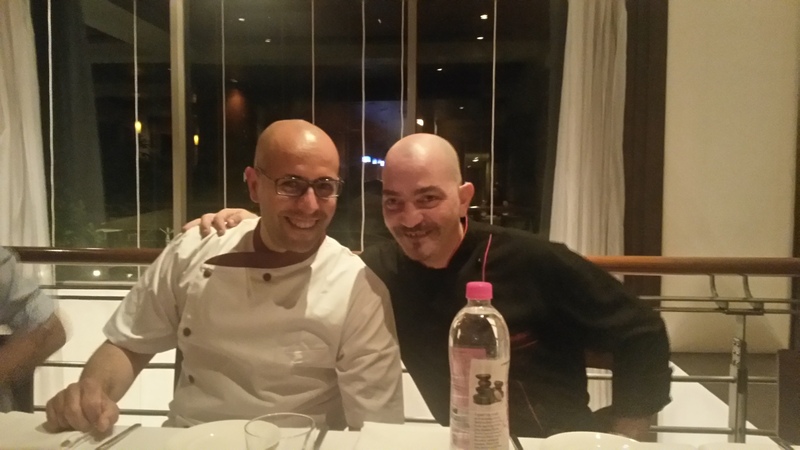 We went through the course with Pasqualino and Chef Davide Canazi the head Chef at Mezzo Mezzo for company. . Davide was almost after me with a knife when I said ‘India loved chicken tikka on pizza’, because the Italians do not ever put chicken on the pizza. After an awe inspiring performance from Barbasso, we settled back at the table waiting for some pizzas. 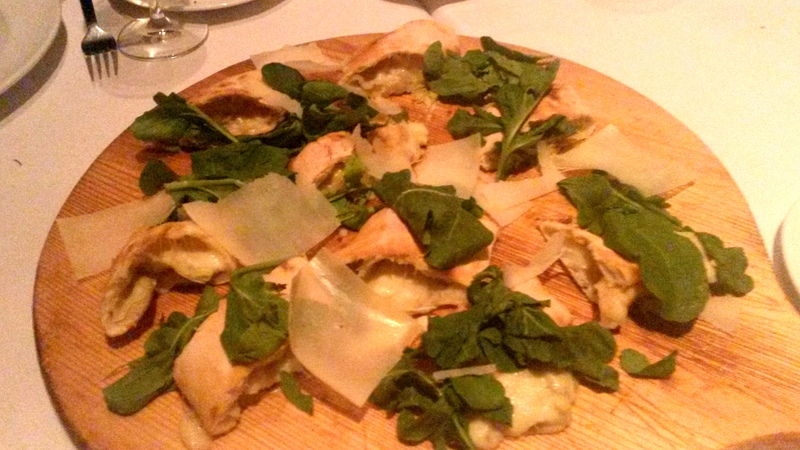 The first to arrive was the Arrotolata (Rs 1200, veggie version without the Bresaola) a stuffed pizza with Artichoke, artichoke puree and mozzarella. It was very mild and subtle and the Sicilian chilli oil enhanced it even more. 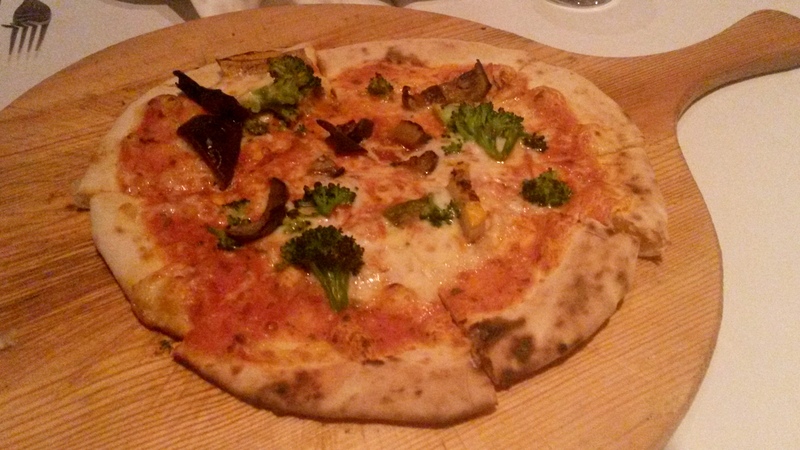 The veggy (Rs 1200) set a new low for pizzas, the dough was great but the pizza was drab and tasteless. I almost thought to myself, perhaps being vegetarian is a crime! 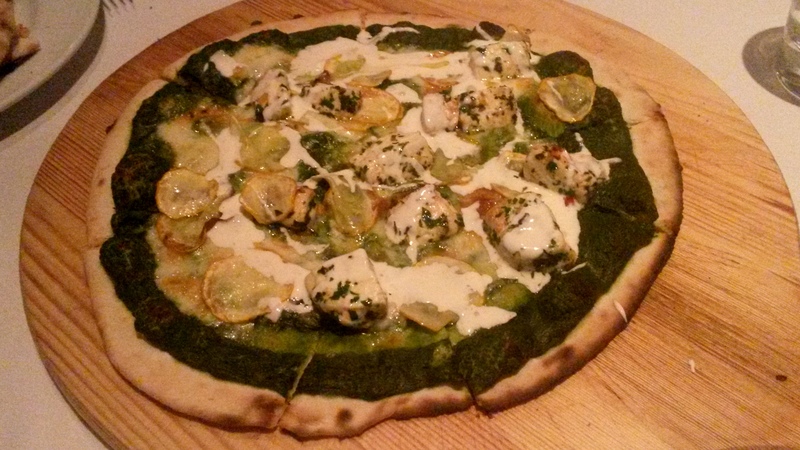 Lastly was the Mezzo Mezzo (Rs 1200, veggie version without ham) inspired from palak paneer, got in a ray of light. The Italian wines; Tuscans, a white trebbiano blend and the red a Sangiovese blend went well with the antipasti and then the pizzas. 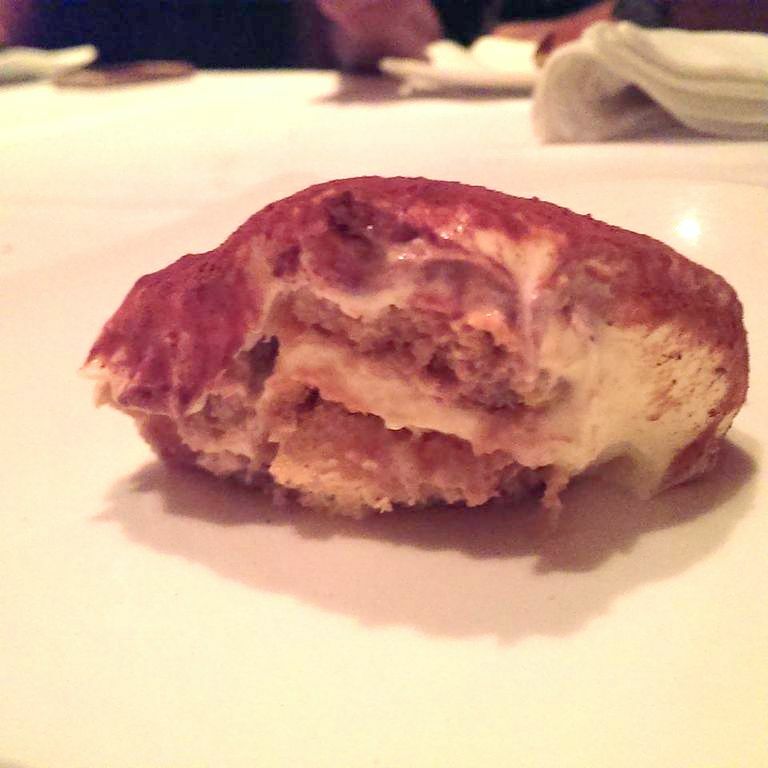 Mezzo Mezzo, Palak Paneer inspired..
We ended with a Tiramisu which in Davide’s words will make you fall in love with the chef. And I think he was bang on, it was the best Tiramisu I have had in recent memory, moist sponge fingers, with a good dose of coffee and with a generous layering of creamy Mascarpone! The fellow media seemed to have enjoyed the array of non-vegetarian pizzas, so meat eaters can still go ahead and enjoy the experience but for all the vegetarians, I think you can give it a skip. 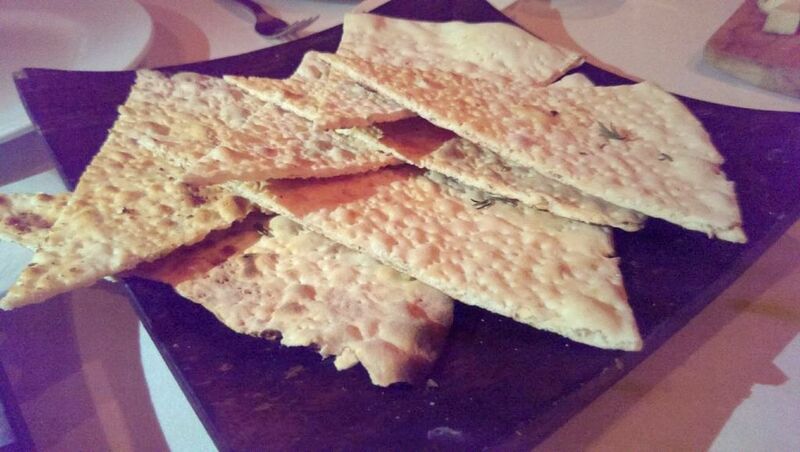 Without any doubt, the Italian food is absolutely delicious!